Keywords: address quality, data quality, addresses, Microsoft Dynamics CRM, duplicates, postal address check, address correction, error-tolerant search, software, add-on. 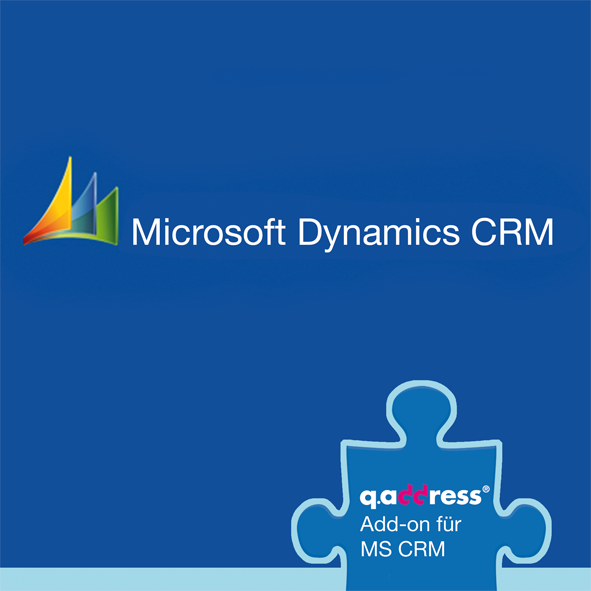 Microsoft Dynamics CRM has developed to an approved solution for marketing, sales and customer management. q.address is the leading add-on that maintains the data quality in Microsoft Dynamics CRM at the high standard that you expect. As q.address monitors every change in the address inventory duplicates and errors in addresses and names are safely prevented. Hence the address quality is maintained in the CRM-System. The q.address add-on is integrated in all relevant CRM-Dialogs during installation and it monitors all the new address creations and address changes. If the tests give a correct result, then the user will not notice anything. If q.address locates an uncritical error in street name or in the postal code, then the error is corrected and the user is notified. Also in this case the users’ workflow is not interrupted. Only in case an error is found, which should not be eliminated by q.address automatically, a new dialog opens and the user is requested to take action. The tolerance limit up to which q.address should operate automatically is configurable. Similarly possible duplicates are displayed. As a user you can then decide whether one of the displayed addresses actually is a duplicate. q.address add-on for Microsoft Dynamics CRM takes care that addresses are checked comprehensively in case of every new creation and change, over and beyond also in case of address imports. Duplicates and errors in addresses and names are reliably prevented. It is often difficult to find addresses in the databases as the spelling of the name stored is not known. For example if the name “Estate Agency Mayr” is stored and you search for “Meier Real Estate”– without q.address – then the search may take many attempts! q.address searches error-tolerant and also locates tricky cases. Phonetic errors such as Sibylle/Sybille, Meier/Meyer/Mayr or Cerni/Tscherny are only the fundamentals. Typing errors such as incorrect characters and jumbled letters or errors in addresses (incorrect postal codes or incorrectly written names of cities- and streets) are also located by q.address. Generally q.address will also smoothly locate abbreviations, changed order of words and acronyms which frequently appear in the business addresses: for instance “Estate Agency Mayr” instead of “Meier Real Estate”, or “CRB” instead of its original name “Consumer Research Body”. By the way, he search is fast as lightning! Imported address lists can be checked in batch mode. Similarly it is recommended to check the entire database once in a while because in spite of all preventive measures and warnings, duplicates can never be eliminated entirely. Also postal codes, names, cities and streets change from time to time. Many users extended Microsoft Dynamics CRM. Existing entities are often customized or new ones added. To allow q.address to check and to search error-tolerant for these changed and new entities, they have to be connected to q.address. In most cases this may be achieved by clear configuration measures only without the need to write a single line of program code. Furthermore for complicated cases q.address SDK is available for Microsoft Dynamics CRM by which all the functions of the add-on may be utilized. q.address is available for Microsoft Dynamics CRM 3.0, 4.0, CRM 2011 (5.0), and Microsoft Dynamics CRM online respectively – as far as available for MS CRM – as 32-bit- and 64-bit-version. q.address supports all client types (Web-Client, Outlook-Client, Internet-Client (IFD Internet Facing Deployment)) as well as several clients (multi-tenancy). The language interface can be changed easily (German and English). q.address is also used in complex system peripheries (Multiple Server Deployment with assigned CRM-Roles, CRM Server Farm with NLB, SQL Server Cluster, virtual server etc.). The integration is done in complete accordance with the guidelines given by Microsoft: The integration is “Microsoft supported”. There are no conflicts in case Microsoft Dynamics CRM or q.address should be updated or uninstalled.